Tree species in the genus Cedrela P. Browne are threatened by timber overexploitation across the Neotropics. Genetic identification of processed timber can be used to supplement wood anatomy to assist in the taxonomic and source validation of protected species and populations of Cedrela. However, few genetic resources exist that enable both species and source identification of Cedrela timber products. We developed several ‘omic resources including a leaf transcriptome, organelle genome (cpDNA), and diagnostic single nucleotide polymorphisms (SNPs) that may assist the classification of Cedrela specimens to species and geographic origin and enable future research on this widespread Neotropical tree genus. We designed hybridization capture probes to enrich for thousands of genes from both freshly preserved leaf tissue and from herbarium specimens across eight Meliaceae species. We first assembled a draft de novo transcriptome for C. odorata, and then identified putatively low-copy genes. Hybridization probes for 10,001 transcript models successfully enriched 9795 (98%) of these targets, and analysis of target capture efficiency showed that probes worked effectively for five Cedrela species, with each species showing similar mean on-target sequence yield and depth. The probes showed greater enrichment efficiency for Cedrela species relative to the other three distantly related Meliaceae species. We provide a set of candidate SNPs for species identification of four of the Cedrela species included in this analysis, and present draft chloroplast genomes for multiple individuals of eight species from four genera in the Meliaceae. Deforestation and illegal logging threaten forest biodiversity globally, and wood screening tools offer enforcement agencies new approaches to identify illegally harvested timber. The genomic resources described here provide the foundation required to develop genetic screening methods for Cedrela species identification and source validation. Due to their transferability across the genus and family as well as demonstrated applicability for both fresh leaves and herbarium specimens, the genomic resources described here provide additional tools for studies examining the ecology and evolutionary history of Cedrela and related species in the Meliaceae. Cedrela P. Browne is a Neotropical tree genus in the mahogany family (Meliaceae Juss.) that consists of 18 named species . Cedrela species range from Mexico (24° N) to Argentina (27° S), and many species are sympatric across their geographic distributions. Three Cedrela species, C. angustifolia DC., C. fissilis Vell., and C. odorata L., are listed with the Convention on International Trade in Endangered Species of Wild Fauna and Flora (CITES) under Appendix III, which requires documentation showing that imports did not originate in parts of their range where logging is prohibited, namely Peru, Guatemala, Bolivia, and Brazil . Large and overlapping species ranges complicate the identification of imported Cedrela logs and processed timber , as the task of distinguishing between restricted versus legally logged Cedrela species falls to customs officials who often employ the expertise of a wood anatomist . Distinguishing between restricted and legal stands of the same species, for example C. odorata harvested in Ecuador (legal) versus C. odorata harvested in Peru (where CITES prohibits logging), presents and even greater challenge because wood anatomy alone cannot identify and differentiate source populations of the same species . Genetic identification approaches can be used to supplement wood anatomy for the taxonomic and source validation of imported timber [5–7]. However, three challenges exist for the development of genetic markers for identification of Cedrela wood specimens. First, it is uncertain whether the 18 described Cedrela species represent distinct species, subspecies, or hybrids . The most-recent DNA-based phylogenies for Cedrela show inconsistent support for some species [1, 8, 9]. Moreover, Cedrela are tetraploid [1, 10, 11] and evidence suggests that common DNA markers like nuclear rDNA used to infer the phylogeny of Cedrela may reflect concerted evolution and non-Mendelian inheritance, rather than evolutionary relatedness . Because the Cedrela phylogeny forms the basis for CITES protection, taxonomic uncertainty complicates the enforcement of CITES regulations for logging and trade in Cedrela timber. The second challenge pertains to the development of markers for geographic assignment of Cedrela specimens to population of origin. Spatial genetic structure among populations of C. odorata and C. fissilis [8, 9, 13–17] has been examined using multiple genetic markers (nuclear rDNA, chloroplast non-coding genes, chloroplast microsatellites), and these studies identified spatial structure across broad geographic regions: a latitudinal gradient in chloroplast and nuclear haplotypes for C. odorata populations across the extent of its range , and a longitudinal gradient among C. fissilis flanking the ‘Cerrado’ savanna ecoregion of Brazil and Bolivia [13, 14]. While these markers may be useful for coarse-level regional assignment, it is unclear if they could provide fine-scale classification accuracy necessary for differentiating timber from protected concessions, or differentiating timber from neighboring countries that offer contrasting levels of protection for Cedrela species. The third challenge for the genetic identification of Cedrela timber is a lack of specimens of known geographic origin which are necessary for the construction of a comprehensive reference genomic database for taxonomic and source validation of confiscated timber. This study addresses the above challenges by establishing a foundation of taxon-specific genetic information via high-throughput genomic sequencing of georeferenced herbarium specimens. We designed a set RNA probes for hybridization capture target enrichment (‘target capture’) of 10,001 putative low-copy gene targets from the Cedrela odorata transcriptome, and used these probes to enrich targets from genomic libraries of five Cedrela species, including the CITES-listed species, to identify high-confidence single nucleotide polymorphisms (SNPs) for species identification [18–20]. We also evaluated the transferability of enrichment probes for the genomes of three other Mahogany family relatives, including American mahogany (Swietenia mahagoni (L.) Jacq. ; subfamily Cedreloideae), Guarea guidonia (L.) Sleumer, and Trichilia tuberculata C. DC. (subfamily Melioideae), and we determined the number of genes that could be enriched to a usable depth for each species. Finally, we provide draft chloroplast genomes for 43 specimens representing the eight evaluated taxa. These genomic resources can be used to provide more accurate estimates of taxonomic boundaries, population genetic structure, and historical demography for Cedrela species, and these may aid the assessment of species risk and forest resource conservation. The generality of these techniques (probe design, assessment of probe transferability, target capture efficiency) has wide applicability for the development of tools to combat illegal logging across tropical hardwoods, and the markers we report herein will be useful for developing protocols for genotyping of Cedrela wood. A single Cedrela odorata leaf from Oaxaca, Mexico obtained from the New York Botanical Garden (CEOD-NYBG) was used for transcriptome reference assembly and target capture probe design (Fig. 1; see Additional file 1: Table S1). We extracted RNA and DNA from fresh tissue from a mature, expanded leaflet, and poly(A)-selected RNA was converted into cDNA and sequenced using the Illumina HiSeq 3000 platform. Detailed information about the transcriptome is provided in Table 1. RNA-seq yielded 1.5 × 108 paired end 101 base pairs (bp) sequences (30.4 Gbp), and quality trimming and adapter filtering removed about 4% (6.0 × 106) of these paired sequences. From the trimmed sequences, one-third (4.9 × 107) could be combined to form FLASH-extended ‘super reads’ , and these were combined with unextended paired trimmed reads for de novo transcriptome assembly using a pipeline  based on the ABySS assembler (; see Methods). Our assembled transcriptome contained 52,181 transcripts (‘gene models’) from 4.8 × 107 nucleotides . Of these, 28% (14,508) of gene models were greater than 1000 bp (Kbp) in length, and they range in length from 37,635 bp to 200 bp (arbitrarily assigned length cut-off). The estimated mean gene model length was 916 bp, the N50 was 1470 bp, and overall transcript GC content was 39.5%. Gene family and ontology prediction with TRAPID/PLAZA 2.5 [25, 26] determined that 73% (38,218) of the gene models contained open reading frames (ORFs) and a stop codon, and that 49% (25,755) of gene models included a start codon. Full-length annotations were determined for 14% (7165) of gene models, quasi full-length annotations (longer exons than predicted) were inferred for 18% (9540) of the gene models, and partial–length annotations were provided for 28% (14,491) of the gene models. The mean length of ORFs among our gene models was 418 bp. TRAPID/PLAZA inferred that 21% (10,904) of gene models show one or more putative frameshifts. Forty percent (20,985) of gene models could not be annotated. More than half of our gene models could be associated with a gene family (31,512; 60.3%), and 6043 gene families were represented among our gene models. The largest gene family identified (5860_HOM000003) included 304 transcripts and showed homology to pentatricopeptide repeats (PPR), a high-copy gene family known to coordinate nuclear control of organelles and organelle signaling . TRAPID/PLAZA predicted over 5000 total gene ontology terms were represented in our transcriptome reference (2.6 × 104 gene models with gene ontology terms; 49% of gene models). Moreover, 54% (2.8 × 104) of our gene models could be associated with protein domains curated in InterPro . We designed probes for target capture from 10,001 gene models that appeared to be present in low-copy number in the genome of CEOD-NYBG. We identified the relative abundance of each of the 52,181 gene models by mapping truncated genomic DNA sequencing reads (50 bp) to the CEOD-NYBG transcriptome with BBTools . This allowed us to count the number of genomic reads homologous to each transcript; these values were normalized by transcript length to reflect mapped reads per 1 Kbp of gene model (or “RPK”). The RPK values for genomic regions homologous to reference transcripts showed a global mean of 3.5, and ranged from 0 (presumably contaminants, e. g. rare leaf endophytes) to 1890 (presumably expressed, high copy genes). Gene models were sorted in ascending order by RPK value, and we selected 10,001 gene targets with ranks between 5000 to 15,000 (RPK range: 0.6 to 1.0; mean RPK = 0.8). Our gene targets ranged in length from 200 bp to 8118 bp with an estimated mean length of 576 bp. See Additional file 1: Figure S1 to examine the distribution of mapped reads for the transcriptome and RPK range of values for our selected gene targets. We assessed the transferability and target capture efficiency of hybridization probes designed from the CEOD-NYBG reference tree using 8 specimens of the source species (C. odorata L.), 16 specimens from four other Cedrela species (C. angustifolia DC., C. fissilis Vell., C. montana Moritz ex Turcz., and C. saltensis M. A. Zapater & del Castillo), 2 specimens from the same subfamily in the Meliaceae (Swietenia mahagoni), and 17 specimens from a different subfamily in the Meliaceae (Guarea guidonia, Trichilia tuberculata). DNA sequencing after target capture generated 3.7 × 108 paired reads (73.9 Gbp), with a mean per-library yield of 8.5 × 106 paired reads (range: 4.4 × 105–2.9 × 107 paired reads; Table 2). Sequence reads from individual libraries were mapped to the gene targets to determine the proportion of sequenced reads that were on-target. On average across specimens, 1.6 × 106 sequence reads mapped to the gene targets (mean on-target yield; range: 6.6 × 103–1.1 × 103), or on average, 20% of sequenced reads from an individual specimen mapped to the gene targets (range 0.8–41%). Out of 10,001 gene targets, only 206 (2%) showed no mapped reads. Across all samples, Cedrela specimens had a significantly higher proportion of on-target reads (mean on-target yield = 2.8 × 106 reads) than was observed for other Meliaceae genera combined (mean on-target yield = 2.1 × 105 reads; unpaired t test, t = 4.95, df = 23.86, p < 0.001), indicating that hybridization probes derived from C. odorata were far more effective at capturing sequence targets from other Cedrela than more distant relatives. To estimate the number of gene targets that could be potentially examined for each species with target capture, we tallied the number of gene targets covered at an average depth > 10 for all individuals in the species (a conservative depth for distinguishing homo- vs. heterozygosity at a locus ). As noted above, Cedrela specimens yielded the largest number of usable gene targets, with more than 3000 gene targets recovered at a depth > 10 for all Cedrela species (Fig. 2). The number of usable gene targets was negatively correlated with the number of samples in each species group, due in part to our stringent depth requirement, sampling variability, and missing information across such a large number of gene targets. Moreover, the number of usable gene targets was dependent upon the quality of the included libraries; for example, C. fissilis 112, 211, and 9 showed significantly lower on-target yield compared to other C. fissilis libraries (Table 2). This reduced our estimate of reliably enriched genes for this species. Swietenia mahagoni showed the highest individual mean depth of non-Cedrela genera, and had nearly 4000 gene targets retained at depth 10X or greater. Finally, only 774 and 565 gene targets met our depth filter of 10X for the more distantly related taxa G. guidonia and T. tuberculata, respectively (Fig. 2). The overall proportion of mapped reads to nuclear gene targets is influenced by many factors, such as organelle abundance, library quality, and PCR dynamics, so we compared the efficiency of target capture across species with reduced bias by mapping 106 organelle-depleted reads from each library to the gene targets and estimating resulting read depth. In this exercise, target depth ranged from 0X (at 272 gene targets) to 86.5X, and the estimated mean target depth was 7.5X (1st quantile 3.3X; 3rd quantile 10.0X). The global mean depth across Cedrela specimens (12.8X) was higher than the mean depth for S. mahagoni (3.4X), G. guidonia (0.8X), and T. tuberculata (0.6X) specimens. This finding shows that our hybridization probes more effectively sampled Cedrela libraries after accounting for differences due to library size and organelle genome proportion (unpaired t test, t = 26.92, df = 31.65, p < 0.001). Figure 3 shows the distribution of depths of coverage for each gene target – individual pair grouped by species (see Additional file 1: Figure S2 for another view of the same data). The distribution for the Cedrela specimens are overlapping and converging on mean depth of coverage despite differences in sample size (number of specimens) for each species group and despite variability in on-target yield. By using a pipeline combining SAMtools  and the Genome Analysis Toolkit , we identified 444,979 variants across 23 individual captured libraries from 5 Cedrela species. Of the detected variants, 399,117 (89.7%) were bi-allelic SNPs, 28,069 (6.3%) were insertions or deletions (indels), and 17,793 (4.0%) were SNPs with more than two alleles. After removing indels and SNPs with more than two alleles, missing information for bi-allelic SNPs ranged from 7.7 to 35.9% per individual and averaged 19.8%. After applying three stringent filters (biallelic SNPs with minor allele frequency (MAF) > 5%; site quality > 500; no missing information), we detected 119,020 SNPs across 9598 gene targets in our sample of 23 Cedrela specimens. 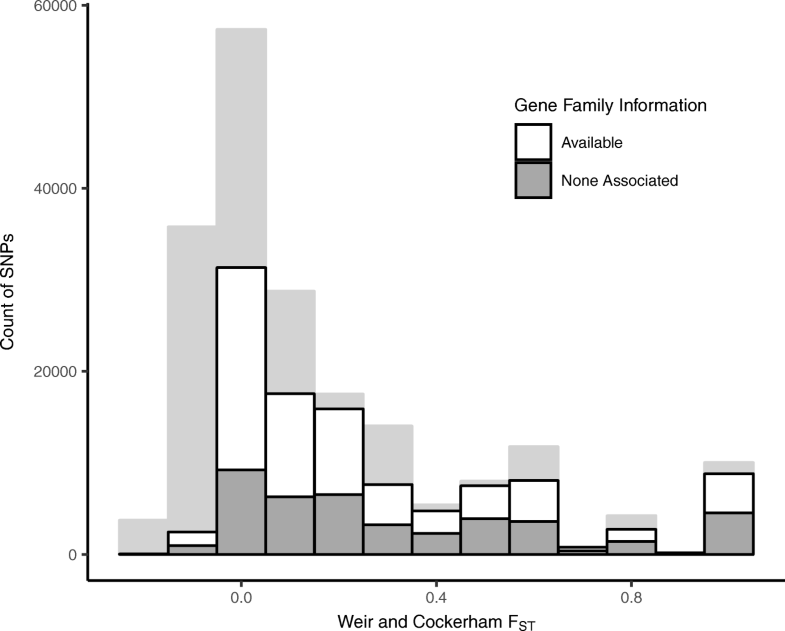 To evaluate the utility of these SNPs for species determination, we calculated Weir and Cockerham’s FST  on a per-marker basis using VCFtools , and Cedrela species as ‘populations’. We excluded C. montana because SNPs unique to this single specimen (C. montana 50) led to an over-representation of SNPs with an FST of 1. FST was calculated with these individuals and species: two C. angustifolia (specimens 88, 143); ten C. fissilis (specimens 9, 19, 112, 130, 140, 211, 230, 254, 264, 292), seven C. odorata (specimens 10, 52, 162, 185, 202, 222, 277); and three C. saltensis (specimens 75, 102, 186). For the 215,799 biallelic SNPs with no missing information, the mean FST was 0.2, with a range of 0–1 (Fig. 4; light grey bars); the mean and range of FST for the stringently filtered subset of 119,020 biallelic SNPs was essentially identical (Fig. 4; bars outlined in black). We determined that 71,441 of the stringently-filtered SNPs appeared on 5693 gene targets with associated gene family and gene ontology information (Fig. 4; white portion of bars outlined in black). Of the stringently-filtered SNPs, 22,074 SNPs (or 5.6% of the detected variants) had an FST ≥ 0.5, and 9081 of the candidate SNPs (2.1%) had a FST of 1, indicating a high degree of fixation among species. This subset of high-quality SNPs provides a pool of candidate SNPs for that can be used for the identification of Cedrela wood specimens to species. DNA sequencing of CEOD-NYBG generated 2.3 × 108 paired sequences (46.7 Gb), and these were used unmodified for de novo chloroplast genome assembly using NOVOPlasty . NOVOPlasty used 3.5 × 105 reads (0.2%) to assemble three contigs, one with 140,933 bp and two that were 19,220 and 19,117 bp in length. Alignment to the Azadirachta indica A. Juss. chloroplast genome  revealed that the largest contig included two inverted repeat regions separated by the large single-copy region. The two remaining 19 Kbp contigs represented both orientations of the small single-copy region; we retained the small single-copy contig that matched the orientation of the A. indica chloroplast genome. Since we did not know the size of the putative missing sequences at the two contig junctions, contig boundaries were separated by 100 “N” bases. The final length of the reordered assembly was 160,153 bp, and GC content was 37.9%. By mapping the original paired sequences back to this reference, we determined that chloroplast DNA accounted for 1.4% of the mapped reads (6.3 × 106), and the final depth of coverage of the assembly was estimated at nearly 4000X. RAST  annotated 269 elements in the CEOD-NYBG draft chloroplast genome. Of the 269 elements, 184 (68.4%) were hypothetical proteins and 85 (31.6%) were genes that could be associated with function. Some of the elements that could be associated with function could be grouped into subsystem categories: twenty-one were associated with photosynthesis, five with RNA metabolism, four with respiration, two with protein metabolism, and one with carbohydrate metabolism. Once assembled, we used the CEOD-NYBG chloroplast genome reference to guide chloroplast genome assembly for the additional specimens used for target capture. Coverage statistics showed that the number of reads with chloroplast identity averaged 4.3 × 105 (range: 3.6 × 104–3.8 × 106) across all samples (Table 2). Chloroplast genome coverage averaged 92% (range: 61–100%), and the mean depth of coverage was 280X (range: 25 - 2399X). Following genome alignment with MAFFT ([37, 38]; see Methods), we used RAxML  to infer the maximum likelihood phylogeny of chloroplast genomes with 1000 bootstrap replicates (Fig. 5; see Additional file 1: Figure S3). 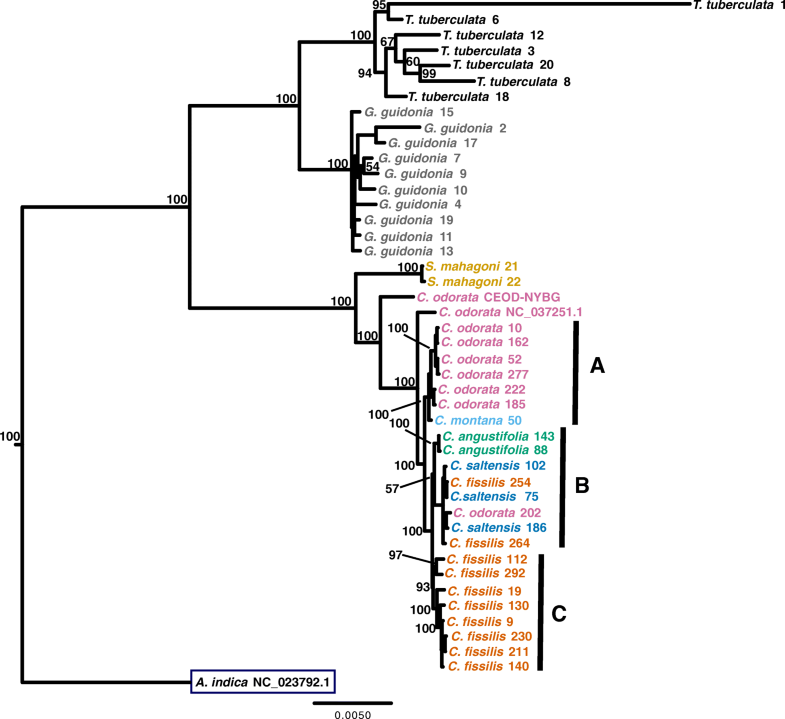 This phylogeny included the CEOD-NYBG reference, chloroplast genomes we prepared by reference-guided assembly, and two publicly available chloroplast genomes from the Meliaceae: A. indica NC_023792.1 and C. odorata NC_037251.1 [35, 40]. Our alignment for all taxa contained 11,950 SNPs, 1695 of which were segregating within Cedrela taxa (~ 7.6 SNPs/Kbp). All genera resolved as monophyletic with strong bootstrap support, despite low-coverage assemblies for some G. guidonia and T. tubderculata (Table 2). While Cedrela taxa resolved as a single clade, Cedrela genomes were not monophyletic within species, with the exception of C. angustifolia. Most strikingly, the CEOD-NYBG reference specimen from Oaxaca, Mexico resolved as sister to all Cedrela in our analysis; a similar placement was also observed with the C. odorata NC_037251.1  from Cuba (Fig. 1; see Additional file 1: Table S1). These geographically distant specimens possessed genetically divergent haplotypes relative to South American C. odorata that appeared to predate the divergence of chloroplast genomes currently residing in South American Cedrela species. Within Cedrela, we designated three subclades to aid interpretation (Fig. 5). Subclade A contained only Central American Cedrela but also included C. montana 50 from Colombia (Figs. 1 and 5). Given that we included a single C. montana sample in this analysis, we don’t know whether this resolution is typical or anomalous for C. montana. 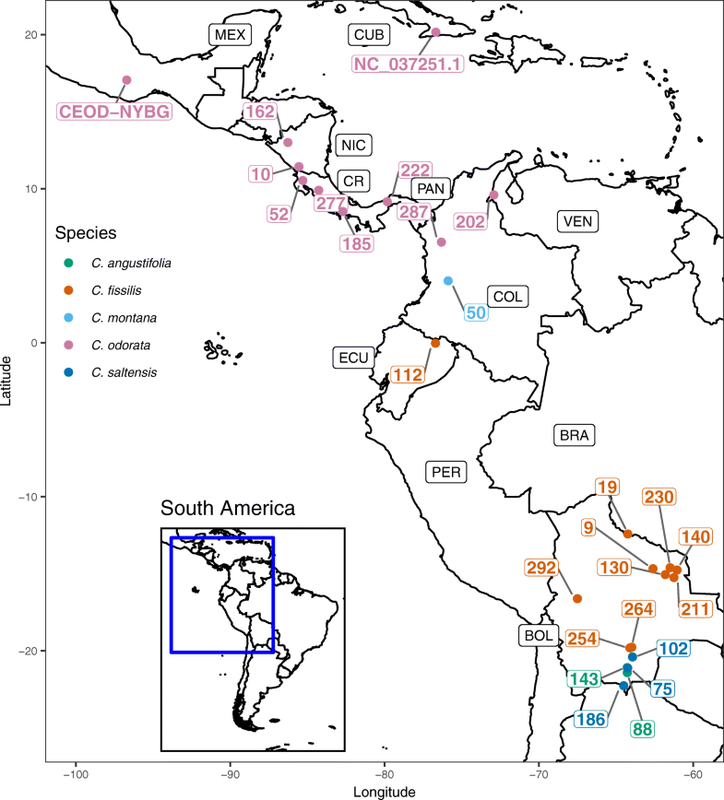 The remaining C. odorata in Subclade A resolve into three strongly supported sister pairs (99–100% bootstrap support) that are congruent with geography: C. odorata 10 and 162 from Nicaragua, C. odorata 52 and 277 from Costa Rica, and C. odorata 222 and 185 from Panama. Subclade A was sister to a South American lineage of two subclades, B (weakly supported; 57% bootstrap support) and C (strongly supported; 93% bootstrap support; Fig. 5; see Additional file 1: Figure S3). Subclade B contained representatives of four species from the same geographic region of Bolivia (Gran Chaco), with the exception of C. odorata 202 from Venezuela (Figs. 1 and 5). This clade also contained the only monophyletic Cedrela species in our study, C. angustifolia. The remaining taxa in this clade included a mixture of C. fissilis and C. saltensis specimens. Given the geographic proximity of these specimens and the weak differentiation of linages indicated by low bootstrap values, chloroplast haplotype variation likely reflects a combination of recent primary divergence, potential secondary contact and introgression/hybridization, and geographic structure. Subclade C also showed evidence of phylogenetic and geographic signal (Fig. 5). This clade was composed exclusively of geographically proximate C. fissilis samples from northern Bolivia and Southern Brazil (Fig. 1), with the exception of C. fissilis 112 from Ecuador. The main objective of this study was to design hybridization capture probes that enriched targets from the genomes of Cedrela species with the ultimate goal of applying genome-scale resources to species identification and spatial origin assignment of wood specimens and population genomics studies. Although we don’t address technical issues associated with DNA extraction from wood and species identification, we provide a set of markers for species validation that can be tested by groups developing protocols for genotyping DNA from Cedrela wood . Additionally, we present a framework to develop custom genetic markers to screen wood DNA of other tree species accompanying existing protocols for DNA extraction from wood [41–48]. Our first step required the assembly a draft transcriptome for Cedrela odorata, a member of the subfamily Cedreloideae, a group that includes many prized timber species (e.g., Swietenia, Khaya, Entandophragma ) that are the focus of agroforestry and breeding, as well as targets of illegal logging. Despite the economic importance of the mahogany family as a source of timber and medicine [50–53], few transcriptome and genome resources from the ~ 600 described species in this family exist. Transcriptomes have only been described for four species, Azadirachta indica , Carapa guianensis , Toona sinensi , and Melia azedarach; reference assemblies are publicly available for two of these transcriptomes (1KP project; https://sites.google.com/a/ualberta.ca/onekp/). The transcriptome assembly we present here includes over 52,000 transcript models totaling 47.8 Mbp, and 60.3% of transcripts had gene family and gene ontology information in public databases. Our transcriptome was made from a single tissue and developmental stage (mature leaflets), and it contains 65–70% as many transcripts and assembled transcript bases as fully-characterized tree genomes like Populus trichocarpa (73,014 transcripts, 69.2 Mbp; 41,479 protein-coding genes; ) or Quercus lobata (83,644 transcripts, 72.5 Mbp; 61,773 protein-coding genes; ). A larger proportion of P. trichocarpa genes are associated with gene families (91%) and gene ontology terms (78%) than our gene models for C. odorata; however, we captured a similar number of multispecies gene families (7823 in P. trichocarpa ; 6043 in our C. odorata). Additional effort in transcript sampling (tissues and developmental stages) and annotation is needed to fully describe the transcriptomic and metabolic complexity of C. odorata. We identified 10,001 low-copy gene targets from C. odorata. Our strategy enriched gene targets in the 10th – 30th percentile with regard to exon or transcript number, therefore avoids genes with a higher degree of duplication across the genome of C. odorata, which is presumably tetraploid [1, 10, 11]. Target enrichment of 10,001 gene targets (using 19,740 hybridization probes) showed a high degree of success, as enrichment was demonstrated for all but 206 targets (2% of total). While we demonstrated that these hybridization probes were sufficient for sampling the genomes of 43 specimens, these probes could be further optimized and expanded. Future designs should exclude the failed gene targets, as well as gene targets that enriched a disproportionately large amount of sequence. It’s possible that these targets represent multi-copy genes in Cedrela. Removing these gene targets would improve the uniformity of sampling across targets, increase the average depth for lower-depth targets, and increase the number of reliably enriched genes across the specimens included in the diversity panel. We used C. odorata-derived hybridization probes to enrich target genes from a diversity panel of 43 specimens representing four genera from the mahogany family (Cedrela, Guarea, Swietenia, and Trichilia). By normalizing the sequence read input across species to 1 million organelle-depleted DNA sequences, our results showed that the depth of coverage across Cedrela targets converged on the same mean, regardless of species, sample size, or individual sequence yield (Fig. 5; Table 2). This is consistent with previous studies employing similar techniques that found sufficient enrichment of targets at the generic level in other plants like Pinus [59, 60], Sabal , and Asclepias . Consistent mean sampling depth across Cedrela species demonstrates that this selection of hybridization probes, designed from C. odorata gene models, shows minimal bias for sampling homologous gene targets across the five Cedrela species included in our study. This is relevant for the three CITES-listed Cedrela species, as it demonstrates that future efforts to develop genomic information for these species with hybridization enrichment should show a high degree of success. Similarly, while our experiment included 5 of 18 named Cedrela species, the high transferability of these probes across sampled species makes it likely that they will work with equal efficiency for the 13 Cedrela species not included our study. We imposed a stringent depth of coverage threshold of 10X across all specimens for each species to determine the number of target genes that could be reliably sampled with our probe set (range for Cedrela species: 3093 – 8794). Our rationale for adopting such stringent evaluation criteria is that downstream applications in wood-based DNA identification require targets to have a high expectation for success and reproducibility, leading to likelihoods of individual or spatial assignment when evidence is evaluated in legal proceedings . Target enrichment ‘drop-out’ can occur due to methodological factors (e.g., sampling probability across a large number of targets), as well as biological, locus-specific features that make sampling less reliable (e.g., position of probes relative to indels or introns; base composition) or preclude sampling altogether (e.g., locus deletion; copy number variation) [18, 19]. By excluding genes that show variable enrichment success, we can avoid genes that show sampling bias due to biological phenomena. We identified over 2 × 105 biallelic SNPs that show no missing information across our sample of Cedrela species and individuals. Moreover, this sample includes 9000 high-quality SNPs that show strong differentiation between one or more Cedrela species (e.g., FST of 1). This subset of high-quality SNPs should be useful for classifying Cedrela wood to species. An important caveat of this result is that the ‘global’ FST was calculated from small sample sizes (most notably C. angustifolia (n = 2) and C. saltensis (n = 3); C. montana (n = 1) was excluded for this reason). Small sample sizes can inflate the number of high FST SNPs by failing to accurately account for the variation within species. Additionally, high FST SNPs will disproportionately represent divergence events separating the most genetically divergent lineage. Future refinement of ‘species-specific’ SNPs will require a larger sample size, and analysis methods that partition variation for the identification of species-diagnostic SNPs, such as pairwise FST or machine learning algorithms. This will be particularly important for the task of separating species like C. odorata and C. fissilis, which have large overlapping geographic ranges, show a close phylogenetic affinity [1, 8], and are CITES-listed species . 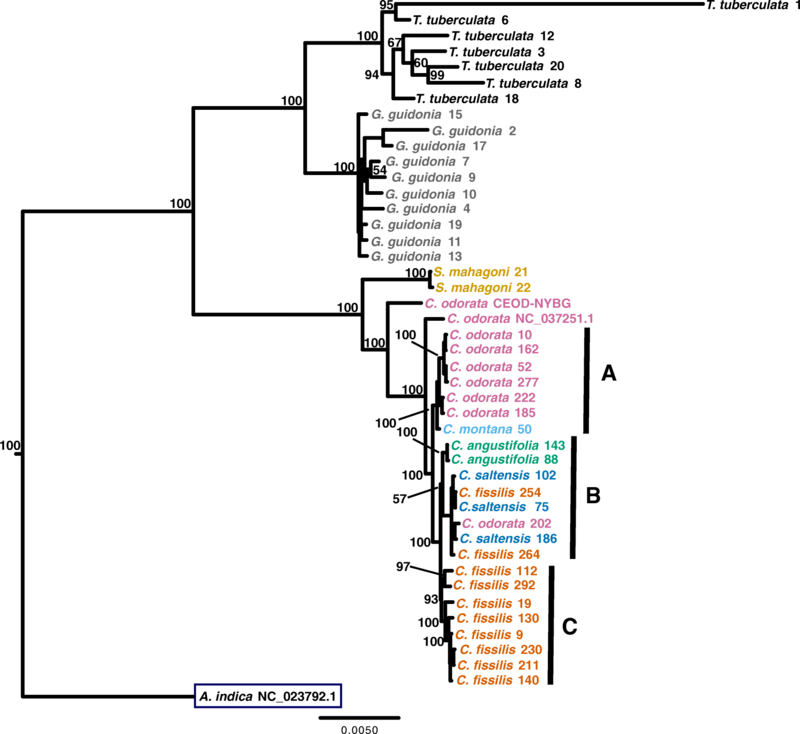 By including samples from the subfamilies Celedroideae (Swietenia) and Melioideae (Guarea, Trichilia), we were able to evaluate the potential for transferring Cedrela-derived probes to similar genetic studies across the Meliaceae. While the hybridization probes derived from C. odorata showed considerable bias for Cedrela, enrichment appears feasible at the level of subfamily , as we were able to reliably enrich 3957 genes from S. mahagoni, the sole representative from the Celedroideae (Fig. 2). Operationally, this means that a large number of gene targets should be cross-compatible with close (e.g., Asian Toona) and distant relatives from other genera (e.g., American and Neotropical Swietenia species, all of which are CITES listed). Members of the Melioideae showed considerably lower target enrichment success (Fig. 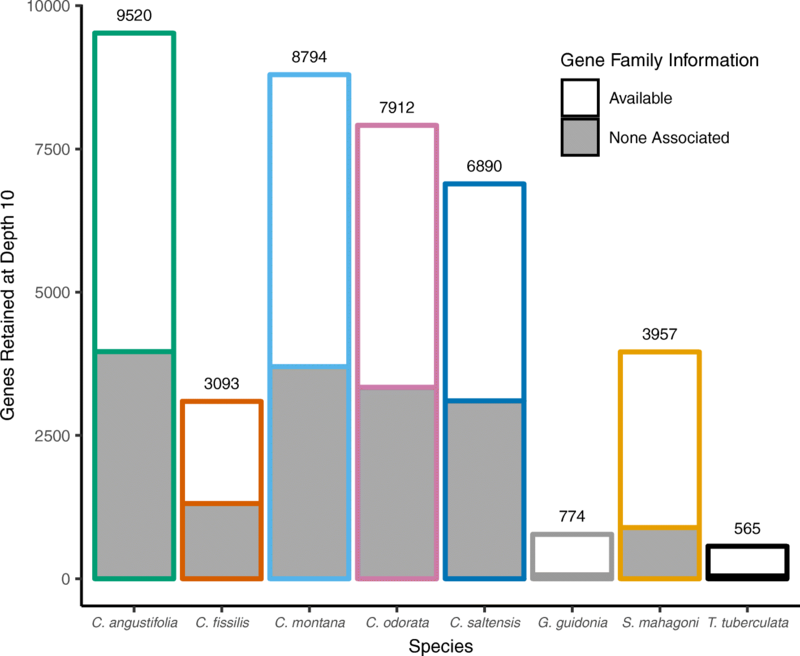 3), with 774 and 565 enriched genes from G. guidonia and T. tuberculata, respectively (Fig. 2). While these representatives showed poor enrichment relative to Cedrela (Table 2), this number of genes is comparable to the yield of more focused target enrichment strategies used for population and evolutionary studies of Neotropical trees (e.g., 264 nuclear loci in Inga ), and it far exceeds the currently available genetic information from G. guidonia and T. tuberculata in the National Center for Biotechnology Information (NCBI). Recent studies have developed target capture probes for a broader phylogenetic scope in plants  and animals  by selected ultra-conserved genes across taxa for probe design; similar approaches could be applied to the Meliaceae, after the release of additional transcriptomes. Studies focusing on chloroplast genome variation among species in Cedrela [8, 67], and more broadly for the mahogany family , have provided a useful taxonomic framework for this study. We add an additional de novo chloroplast genome reference for C. odorata to a growing collection of Meliaceae plastid sequences. Our chloroplast genome was adequate for the reference guided assembly for 43 Meliaceae specimens, but chloroplast genome assembly fragmentation increased with increasing phylogenetic distance from C. odorata . The reduction in completeness of the chloroplast genomes for G. guidonia and T. tuberculata led to long branch lengths (Fig. 5) that were likely due to assembly error, rather than phylogenetic divergence among specimens originating in Panama. By selecting a more genetically proximal assembly reference from subfamily Melioideae (e.g., A. indica), improved assemblies for these taxa should be possible with the sequences presented here. Our inferred chloroplast genome phylogeny from this limited sample of Cedrela shows a general lack of species monophyly, as only C. angustifolia resolved as monophyletic in the five tested Cedrela species. This result is consistent with the known taxonomic complexity in this genus from hybridization , presumably paraphyletic taxa [9, 13], and proposed the existence of ‘cryptic’ species [8, 13]. In our sample, chloroplast genomes appear to be more informative for geographic origin than for taxonomic classification. Cavers et al. (2013) reported a similar trend in C. odorata, which showed spatial genetic structure among chloroplast haplotypes (two chloroplast genes, three chloroplast microsatellites) that reflected latitudinal position. This blurring of taxonomic and geographic signal from the chloroplast has been observed in other angiosperm taxa due to introgression and incomplete lineage sorting, with examples such as Acer , Betula , Quercus , and others [72, 73]. While more testing is required to confirm the utility of whole chloroplast genomes as a geographic marker for Cedrela, whole or partial chloroplast genomes show promise for broad-scale geographic source identification for wood specimens. We present a set of hybridization probes for target capture of genomic libraries from Cedrela species. The probe set is based on gene models selected from a de novo transcriptome assembly from C. odorata, and selected to represent low-copy genes in the subgenomes of this tetraploid species. The probe set can be successfully applied across the genus Cedrela and subfamily Cedreloideae, and it may show limited success with more divergent relatives in the Meliaceae (as demonstrated by obtaining hundreds of genes at reliable depth for distant species G. guidonia and T. tuberculata). In addition to this probe set, we provide draft chloroplast genome assemblies for 43 specimens across eight Meliaceae species, including C. odorata. By comparing SNP frequencies between species, we provide a set of candidate SNPs for species discrimination of C. angustifolia, C. fissilis, C. odorata, and C. saltensis, and we provide preliminary support for the chloroplast genome as a marker of geography for Cedrela, and C. odorata in particular. These genomic resources for Cedrela and the Meliaceae will enable further detailed genetic study of Cedrela, a genus that contains three species of conservation concern and many species that yet to be assessed for conservation status. These resources from target capture should provide a level of resolution that can support the development of genetic screening tools for timber from Cedrela, aiding in the enforcement of CITES regulations for trade in this historically over-exploited plant group. Fresh leaf tissue was collected from Cedrela odorata at NYBG (Fig. 1; see Additional file 1: Table S1; NYBG Accession 683/89; Bronx, NY, USA; Oregon State University Herbarium voucher OSC-V-258305; referred to as “CEOD-NYBG”), and frozen on dry ice for total RNA and DNA extraction (Norgen Plant RNA/DNA Purification Kit, Norgen Biotek, Thorold, Ontario, CAN). RNA and DNA were quantified by fluorometry (Qubit, Thermo Fisher Scientific, Waltham, MA, USA), and RNA was treated with DNase using the TURBO DNA-free Kit (Life Technologies, Thermo Fisher Scientific, Carlsbad, CA, USA). RNA quality and size distribution were assessed using the Agilent 2100 Bioanalyzer (Agilent Technologies, Santa Clara, CA, USA). To construct a poly(A)-selected RNA-seq library, we used the WaferGen Bio-systems Apollo 324 NGS Library Prep System and 500 ng of total RNA (WaferGen Bio-systems, Fremont, CA, USA). To construct the DNA library, 500 ng of total genomic DNA was sheared to a modal size of 130 bp using sonication (30 cycles; 30 s on + 30 s off; Diagenode BioRuptor, Denville, NJ, USA), and adapted an Illumina genomic library using the NEBNext Ultra II Kit (New England Biolabs Inc., Ipswich, MA, USA). The mRNA and DNA libraries from CEOD-NYBG were uniquely indexed, pooled to equal mass representation, and sequenced using one lane of 100 bp paired-end sequencing on an Illumina HiSeq 3000 (Center for Genome Research and Biocomputing [CGRB], Oregon State University, Corvallis, OR, USA). Leaf tissue was obtained from three sources to assess the utility and transferability of our genomic resources (see Additional file 1: Table S1; specimens collectively referred to as the “diversity panel”): herbarium specimen fragments at the Missouri Botanical Garden Herbarium (MO; St. Louis, MO, USA), the living collection at Fairchild Tropical Botanic Garden (FTBG; Coral Gables, FL, USA), and five locations in Panama. Our collections from MO included twenty-three specimens from five Cedrela species: C. angustifolia DC. (n = 2), C. fissilis Vell. (n = 10), C. montana Moritz ex Turcz. (n = 1), C. odorata L. (n = 8), and C. saltensis M. A. Zapater & del Castillo (n = 3). Figure 1 shows the origin of Cedrela specimens. We extracted total genomic DNA from MO specimens with the FastDNA Kit (MP Biomedicals, Santa Ana, CA, USA). For genera outside of Cedrela, we obtained: Sweitenia mahagoni (L.) Jacq. (n = 2; FTBG), Trichilia tuberculata C. DC. (n = 7; Panama), and Guarea guidonia (L.) Sleumer (n = 10; Panama). Total genomic DNA was extracted from FTBG S. mahagoni specimens with the DNeasy plant mini kit (Qiagen, Hilden, Germany). Panama specimens were collected fresh, dried, and stored frozen until DNA extraction with the FastDNA Kit. Genomic DNA from the MO, FTBG, and Panama specimens were quantified by fluorometry, sheared to a modal size of 130 bp, and converted to Illumina libraries as described above. We pooled DNA libraries to equal molar representation for hybridization capture and targeted enrichment (see ‘Target Capture’ section). After target capture, libraries were pooled and sequenced using one lane of 100 bp paired-end sequencing on an Illumina HiSeq 4000 (Genomics & Cell Characterization Core Facility at University of Oregon, Eugene, OR, USA). To gain additional sequences for the Cedrela specimens, the original (unenriched) multiplex and target-enriched multiplex were also each sequenced in separate sequencing reactions, at a proportional representation of approximately ¼ of a HiSeq lane (multiplexing performed with samples from a separate study). These libraries were sequenced using 100 bp paired-end sequencing on the Illumina HiSeq 3000 at the Oregon State CGRB. We assembled the transcriptome of the CEOD-NYBG reference specimen following the de novo transcriptome assembly pipeline [22, 74] developed by the National Center for Genome Resources (Santa Fe, NM, USA). Except where specified, default settings were used for all bioinformatics software programs. Reads from the mRNA-seq library were trimmed using Trimmomatic v. 0.36  with a 4 bp window, sequences that showed an average quality below a phred score of 15 (ASCI_BASE 33) were cropped, adapter sequences were removed, N bases (or sequencing quality below a threshold of 3) were cropped from the leading strand and trailing strand, and sequences less than 36 bp in length were filtered out. We used FLASH v. 1.2.4  to combine overlapping forward and reverse reads into super reads. Super reads and unextended, paired reads were assembled de novo as unitigs with an ABySS v. 1.3.7-maxk128 [23, 76] k-mer sweep (K = 55, 67, 73, and 89). ABySS unitigs were concatenated and filtered with CD-HIT v. 4.5.5 [77, 78] to reduce redundancy of unitigs with 98% identity. Filtered unitigs were then assembled into contigs with CAP3 v. 20071015  and scaffolds were generated with the ABySS scaffold function of run-bpa.pl with a kmer length of 77 bp . We reduced the number of gaps in the transcriptome with GapCloser v. 1.12 for SOAP de novo  by setting the maximum read length to 187 bp for FLASH-extended super reads, 101 bp for unextended paired reads, and an average insert size of 100. GapCloser was repeated until assemblies no longer improved. CD-HIT was used again to reduce redundancies among transcript models. A final filtering step removed transcript models with less than 200 bp. To generate statistics on our final assembly, we used TransRate v. 1.0.3 for Linux . We obtained gene family and ontology information for our draft transcriptome with TRAPID  and the PLAZA 2.5 data source  using Populus trichocarpa as the similarity reference . Using 10,001 transcript models (or “gene targets”) representing low-copy genomic regions in the CEOD-NYBG genome, we designed probes for hybridization capture and target enrichment (target capture). To identify low-copy gene targets, we masked repeats and low-complexity regions of the draft transcriptome with RepeatMasker v. 3.3.0 [82, 83] using Arabidopsis thaliana as the repeat reference. Then, we cropped 101 bp reads from the CEOD-NYBG genomic DNA library to produce 50 bp ‘subreads’ (Trimmomatic v. 0.36 ), which were then locally aligned to the transcriptome with the bbmap.sh tool of BBTools v. 36.14 . Subreads were mapped using a threshold of 95% identity, and mapping conflicts were resolved by retaining multiple high-quality mapping locations. The bbmap.sh “covstats” parameter was used to obtain coverage estimates for all transcript models. Using the covstats data, we estimated the number of mapped genomic reads per 1 Kbp of transcript length (RPK), and we sorted the transcript models by RPK in ascending rank order. Transcript models ranked from 5000 to 15,000 (out of 52,181 total) were chosen as gene targets for target capture. These gene targets were used to design 19,740 custom 100 bp biotinylated RNA hybridization probes (MYbaits™, Arbor Biosciences, Ann Arbor, MI, USA), with two RNA probes per gene target tiled end-to-end beginning at the 5′ end of the gene target. Target capture with MYbaits™ was performed on the genomic DNA libraries prepared from the diversity panel of specimens as directed by the manufacturer. Prior to capture, libraries were pooled in equimolar 24-plex pools for the Cedrela specimens, and as equimolar 19-plex pools for S. mahagoni, G. guidonia, and T. tuberculata genomic libraries. For the 19-plex pools, we used a lower hybridization temperature of 58 °C (as opposed to 65 °C) to accommodate more divergent gene targets. Post-capture enriched targets were amplified using the KAPA HiFi HotStart ReadyMix PCR Kit v. 5.13 (KAPA Biosystems, Boston, MA, USA) and NEXTFlex Primers (Bioo Scientific Corporation, Austin, TX, USA), following the manufacturer’s protocol. We pooled the amplified, captured Cedrela and S. mahagoni/G. guidonia/T. tuberculata libraries at 1:1 M ratios and then added 1/8 mass proportion of unenriched genomic library from eight specimens (T. tuberculata 1, 3, 18; G. guidonia 2, 7, 11; S. mahagoni 21, 22) to increase chloroplast genome coverage for these taxa. This pool was sequenced to obtain paired-end 100 bp sequences using one lane of the Illumina HiSeq 4000 (Genomics and Cell Characterization Core Facility, University of Oregon, Eugene, OR, USA). We assessed sequence yield and on-target yield by mapping captured DNA sequence reads from the specimens back to the gene targets from CEOD-NYBG at 90% identity in local alignment mode with bbmap.sh. At this point, we determined that specimen C. odorata 287 yielded fewer than 106 reads (Table 2). We included it for total sequence yield calculations, but excluded it from all other analyses and calculations. On-target yield calculations were based on the covstats parameter and summarized by individual and species using R scripts . Individual on-target yield was calculated by estimating the sum of sequenced reads that mapped to each gene target (‘plus’ and ‘minus’ strands). We calculated depth by multiplying the sequence read length (101 bp) by the number of sequenced reads mapping to each gene target (‘plus’ and ‘minus’ strands) divided by the covered target length (‘covered bases’). The unpaired Student’s t test was used to determine whether mean on-target sequence yield was higher for Cedrela specimens versus the other Meliaceae specimens. These data, detailed explanations of our analysis in R, and other resources from this study are available through the Oregon State University Scholars Archive . All R packages used for analysis are listed in Additional file 2: Table S2. 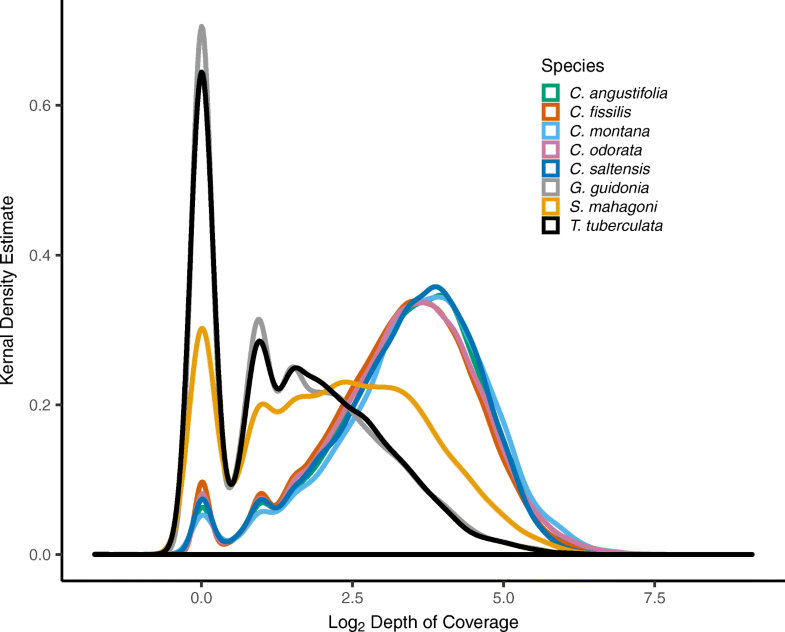 On-target depth per gene target estimates were used to identify ‘reliably enriched regions’ that exceeded a depth of 10 for every specimen within a species (C. angustifolia, n = 2; C. fissilis, n = 10; C. montana, n = 1; C. odorata, n = 7; C. saltensis, n = 3; G. guidonia, n = 10; S. mahagoni, n = 2; T. tuberculata, n = 7). TRAPID gene association information was used to identify the proportion of gene families that could be inferred from reliably enriched gene targets for each species. To estimate sequence (SNP) variation from Cedrela specimens, we mapped the sequenced reads from each individual using the 10,001 gene targets from CEOD-NYBG as a reference with BWA-MEM [85, 86]. Once reads were aligned, we used SAMtools  to convert and sort the alignment files, and the Genome Analysis Tool Kit (GATK) v. 3.7  to define and realign insertions and deletions. SAMtools mpileup was used to generate a vcf , and VCFtools was employed to perform variant filtering . Using these programs, we applied stringent filters to identify a ‘high-confidence’ set of SNPs to differentiate Cedrela species. First, we removed SNPs that showed missing information for any of the individuals, and then removed SNPs that showed minor allele frequency less than 5%. Second, we used the ‘quality metric’ of VCFtools (defined as -10Log10[probability of incorrect SNP call]) to identify and select SNPs showing a high probability of accuracy, defined here as ‘quality > 500’. After filtering, we used VCFtools to calculate Weir and Cockerham’s FST  for SNPs on a per marker basis, using Cedrela species as ‘populations’ in these calculations. We assessed target capture efficiency of the CEOD-NYBG–derived hybridization probes on other Cedrela species and Meliaceae genera by normalizing read count, thus removing the effect of taxon-specific enrichment bias. To do this, we removed sequence reads that showed 90% chloroplast identity with our CEOD-NYBG draft chloroplast genome (bbmap.sh; see next section), and subsampled 106 paired-end sequence reads from each taxon (reformat.sh; BBTools). We mapped subsampled reads by individual to the 10,001 gene targets in local alignment mode with bbmap.sh at 90% identity. We used covstats for each specimen allowing us to estimate depth per gene target, individual mean depth for each specimen, and species mean depth for the eight species groups. We calculated depth as described above, and used an unpaired Student’s t test to determine whether mean on-target depth was higher for Cedrela specimens than for the other Meliaceae specimens. We generated a seeded, overlap-extension chloroplast genome assembly for CEOD-NYBG using genomic DNA sequence reads and NOVOPlasty v. 2.6.2 . C. odorata rbcL (AY128220.1)  was used as the seed sequence, and NOVOPlasty parameters were set to default except: insert size (300 bp), auto-detect insert size (on), read length (101 bp), and k-mer length (23). We aligned the resulting chloroplast contigs to the draft chloroplast genome of A. indica (NC_023792.1)  via the LASTZ-based MULAN aligner . Gene features were annotated using RAST . For each specimen, we concatenated sequence files from all available experiments (e.g., target capture experiments; genome skimming), and mapped reads from each specimen to the CEOD-NYBG chloroplast reference using bbmap.sh in local alignment mode, a 90% identity threshold, and randomly mapping multi-mapped reads. The resulting binary alignment files (BAM) were loaded into Geneious v. 7  with the CEOD-NYBG chloroplast reference. For each specimen, a consensus sequence was generated where bases were coded as ‘N’ if coverage was less than 2X. Sequences were exported as separate FASTA files for subsequent alignment and phylogenetic analysis . We used BBTools covstats to estimate chloroplast abundance in total DNA by calculating the sum of sequenced reads with chloroplast identity for each specimen. Depth of coverage for the chloroplast genomes from the diversity panel was estimated as described above. We also estimated the percent of the reference covered by at least one mapping read using covstats. After compiling draft chloroplast genomes, we used a custom python script to estimate the abundance of ambiguous bases (‘N’) for each genome . Compiled FASTA files containing draft chloroplast genomes from the diversity panel were combined with the CEOD-NYBG draft genome and two publicly available Meliaceae chloroplast reference genomes (A. indica NC_023792.1 and C. odorata NC_037251.1 [35, 40]), and then aligned using the “FFT-NS-2” alignment method implemented in MAFFT  using default parameters. We used this alignment to determine the number of SNPs detected among all taxa and among only Cedrela taxa with Mesquite v. 3.31 [build 859] . Phylogenetic relationships for Cedrela and other Meliaceae representatives were inferred with maximum likelihood and 1000 bootstrap replicates using with RAxML v. 8.2.10  via the CIPRES online server . For this analysis, the default secondary structure substitution model was selected (16-state general time reversible [GTR]), and A. indica was designated as the outgroup. All other parameters were default. A bootstrap majority rule consensus tree was generated with Mesquite with the required frequency of clades set to 0.5, and bootstrap support values (converted to percent) were superimposed over the RAxML best tree result obtained from CIPRES. Output trees were viewed and edited in FigTree v. 1.4.3 . Cedrela odorata specimen obtained from the New York Botanical Garden and used for transcriptome reference assembly and target capture probe design (See Additional file 1: Table S1). The authors thank MO, NYBG, and FTBG for aiding in specimen collection, especially James Solomon of MO, Dennis Stevenson, Samantha Frangos, Lisa DeGironimo of NYBG, Whitney Meier, Bob Brennan, Michael Hass, Brett Jestrow of FTBG. We also thank Eric Manzane who provided specimen collections for the Trichilia and Guarea specimens from Panama. We appreciate the support and sequencing services provided by the Center for Genome Research and Biocomputing at Oregon State University and the Genomics & Cell Characterization Core Facility at University of Oregon. Transcriptome resources presented here were developed during a bioinformatics internship at the National Center for Genome Resources (NCGR; for KNF) supported by New Mexico INBRE with the help from other interns and NCGR staff, especially Hayley Goldblatt and Connor Campbell. Funding for this study was provided by U. S. Agency for International Development award 19318814Y0010–140001 to the U.S. Forest Service International Programs and RCC, U.S.D.A. Forest Service Pacific Northwest Research Station, National Science Foundation award DEB 1257976 to FAJ, and the Moldenke Endowment (Botany and Plant Pathology Department, Oregon State University) to KNF. Raw sequence data associated with this study is available from the NCBI GenBank BioProject Archive under accession number PRJNA369105. KNF, FAJ and RCC jointly designed the study. KNF collected all specimens used in the study; KNF and RCC performed experiments, collected data, and analyzed data; and KNF, FAJ, and RCC wrote the manuscript. All authors read and approved the final manuscript. BBTools. DOE Joint Genome Institute. https://jgi.doe.gov/data-and-tools/bbtools/. Accessed 27 Nov 2018.
rbpa: Transcriptome Assembly Pipeline BPA2.1.0. Shell. National Center for Genome Resources; 2017. https://github.com/ncgr/rbpa. Accessed 5 June 2018. Rambaut A. FigTree, version 1.3. 1. Computer program distributed by the author, website: http://treebioedacuk/software/figtree/. Accessed 4 Jan 2011. 2009.